Astro eating too many biscuits? Get him a dog treadmill and let him work off those extra pounds. If your pup is plump -- statistics say one out of every three dogs is overweight -- he needs a balanced diet and more exercise. And now you can take the dog for a walk…without ever leaving your couch! A dog treadmill offers an ideal low-impact exercise for pets in terms of controlling weight and building muscle. Exercise helps humans with depression and boredom, and that goes for pets too. Even if you live in a rainy climate, or a penthouse apartment, or just don’t want to leave the house, you can still give your furry friend much-needed exercise by purchasing one of the special canine treadmills. The canine treadmill is small enough so that you can concentrate on the fitness needs of your dog, as well as his safety. Deck sizes will vary to accommodate small dogs all the way up to large breeds. 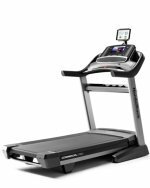 You can buy a 42, 60, 72 or 80-inch treadmill that comes with speeds up to 11 mph. They are also equipped with a manual incline, a paw-friendly easy-grip surface, and come powered by motors that range in power from 250 watts to 3 hp. Prices for a dog treadmill are about the same for a people treadmill, ranging from $599 to $1925. You’ll also find that all models are equipped with side guard rails and include instructions for proper use with a leash or without. Some of the best prices can be found at Amazon so take a look there first to see what kind of deals they have. Why Not Use a Human Treadmill? Treadmills for dogs have low to no maintenance and have easy cleaning belts so that mud, urine, slobber, and shedding hair are not a problem. Your own treadmill may not have a long enough deck if your four-footed friend is a large breed. That being said, you can use a human treadmill just as long as you are cautious about keeping the belt clean and trimming the dog’s toenails so that it doesn’t rip up the belt. But a large treadmill may be intimidating for little Astro if he’s a small breed of dog, and you may have trouble getting him to jump on it. Take a look at one of the dog treadmills and see how it is designed to safely accommodate his size. The instructions will show you how to introduce him to using the machine, and soon he will want to take himself for a walk. Imagine the day when he comes to you, not with his leash in his mouth, but to nudge you to turn on his walking machine.